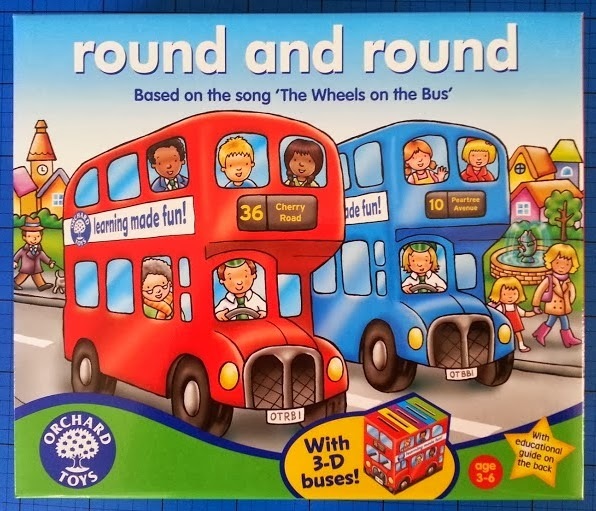 Round And Round by Orchard Toys is a game with 3D elements that are really attractive to children, with the very familiar theme of the song 'The Wheels On The Bus' - including singing and actions! It is designed for 2-4 players and especially suited to children aged 3-6. The game is played on a huge board which is itself a 9 piece jigsaw puzzle. The aim of the game is to travel around the board collecting a selection of elements which appear in the song - windscreen wipers, wheels, babies etc. When you land on the bus stop then you can take a corresponding card and then everyone sings that bit of the song. The winner is the first person to fill all 5 slots on their bus and get back to the Bus Station! 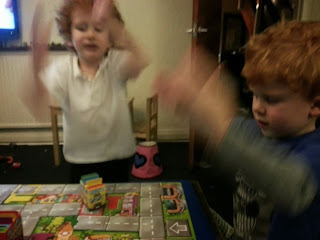 Round and Round is a fantastic first game for a child who is just learning to play. 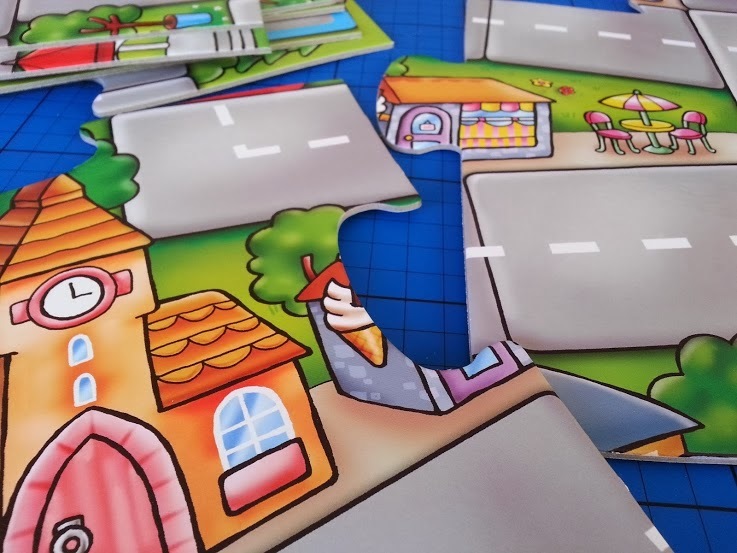 It teaches all of the very basics of gameplay including rolling dice and moving the right number of spaces, taking turns, collecting specific cards and following instructions for specific squares. 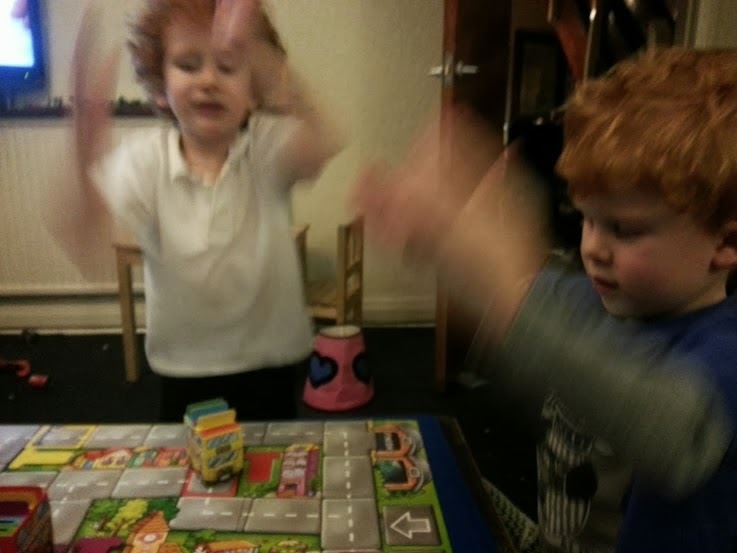 The game is great for promoting colour recognition and is very much about counting and early maths. 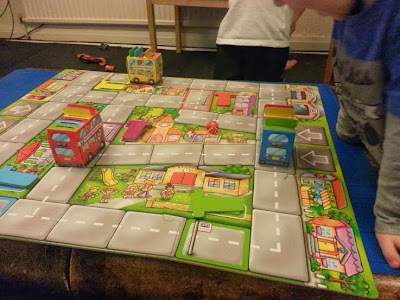 There is only one dice, so children can focus on numbers to 6, but it really promotes strategic thinking because they are trying to reach specific squares, so as they progress they will be able to look and work out what they need to roll in total to get to the right place, and what the best route will be! 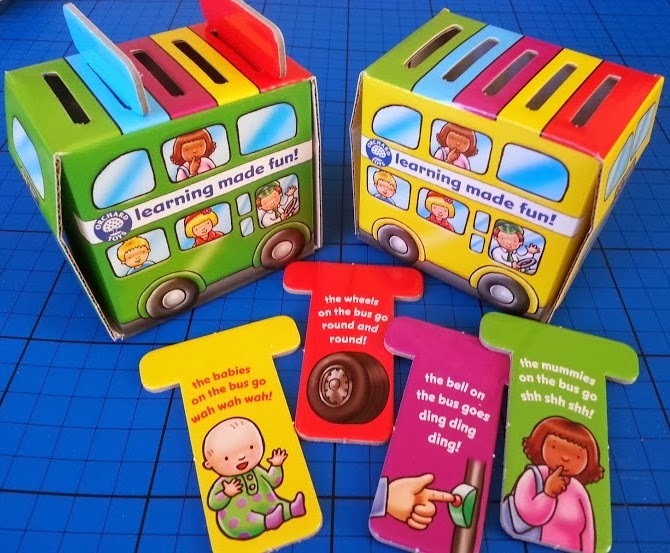 There are 10 different elements of the bus available to collect in 5 different colours, and you only need one of each colour, so there is a degree of anticipation and surprise when you pick up your card and see what you've taken. This is a lovely game. My 5 year old was delighted when he saw the little buses and my 3 1/2 year old loves that he knows the song that goes with the game.The addition of actions and singing makes it quite lively at times, and the 3D buses are brilliant for the children to push around the roadway. 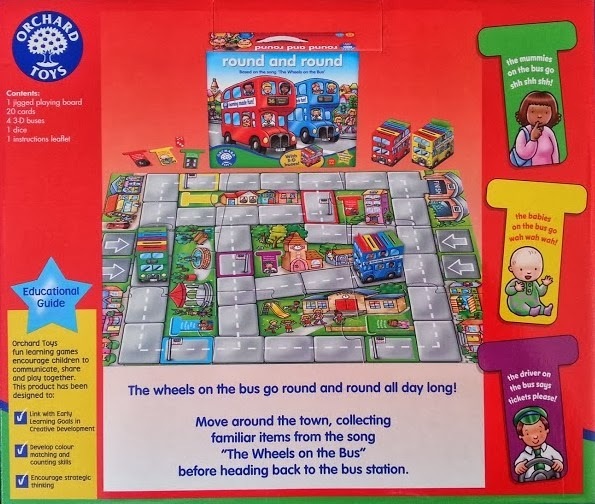 Personally I love that the buses don't need to be let down to fit in the box, it all goes in very neatly although the box isn't any bigger than it needs to be. As with all Orchard Toys games and puzzles Round And Round is made from 100% sturdy recycled board in the UK and the paint is non-toxic. Round And Round is available direct from Orchard Toys for £15.95 with postage free for orders over £20 and a free gift for every order before Christmas. Orchard Toys games and puzzles are also available in toy shops, Tesco, John Lewis and other stores. Orchard Toys offer a free replacement parts service, and if you have any questions their Social Media and Customer Service team will be happy to help you. They also currently have an advent competition running daily on their Facebook page. 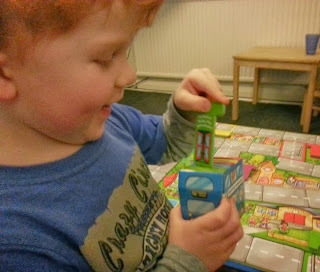 We love Orchard Toys and have reviewed several over the past year or so. They are all listed on my Toy Reviews page. We were sent Round And Round to review. That looks like yet another great OT games! We borrowed this from nursery recently, it's fab. another excellent game from orchard toys! Love Orchard Toys - their games are exceptional quality! !